Symptoms and indications: Burning or difficulty during urination, an increase in the frequency of urination, passage of blood in the urine, puffiness around the eyes, swelling of the hands and feet, pain in the small of the back just below the ribs and high blood pressure. Causes and risk factors: There are many different types and causes of kidney disease. These can be characterized as hereditary, congenital or acquired. These can be transmitted to both males and females, and generally produce clinical symptoms from teenage years to adulthood. The most prevalent hereditary kidney condition is polycystic kidney disease. Other hereditary conditions include Alport\'s syndrome, hereditary nephritis, primary hyperoxaluria and cystinuria. 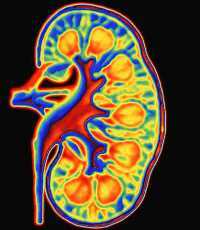 Certain medications, toxins, pesticides and \"street\" drugs (i.e., heroin) can also produce kidney damage. Prevention: Maintaining a balanced diet tending toward alkaline-producing foods is likely to improve kidney functioning.